← Range Rover Sport 3.0 SDV6: Remap to solve turbo lag. Audi A4 3.0 TDI in with us for Engine and Gearbox remap. Massive power gains to be had on this engine, along with hugely faster gear shift speeds from the Gearbox TCU remap. See what we can do for your Audi by clicking HERE. 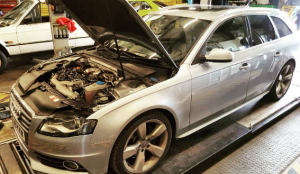 This entry was posted in General and tagged 3.0 tdi remap, audi 3.0 tdi, audi a4, audi a4 remap, audi a4 tuning, audi a5, audi a6, edc17, engine tuning, quattro, remap, remapping. Bookmark the permalink. This blog is no longer active – see our new website! Range Rover Sport 3.0 SDV6: Remap to solve turbo lag. JR Tuning is based in Sittingbourne, Kent and provides performance and economny engine ecu remapping for cars and commercial vehicles. Our engine remaps are arguably some of the best in the world providing huge gains in power and torque along with sharper throttle resopnse, smoother power delivery and better fuel economy. Our economy remapping can offer 10-25% fuel savings depending on your vehicle. Our performance remapping can offer up to 50% power gains depending on vehicle. © Copyright JR Tuning LTD.